Discussion in 'Gaming' started by Rincewiend, May 3, 2018. I've unlocked probably 80%+ of the map just riding around trying to get a feel for it all. I felt like I knew GTAV's map really well quite quickly but this is going to take some learning. How do you go fishing? I've heard it's via a mission but I've not come across that yet. TribbleFeeder, Mr. Laser Beam and Rincewiend like this. Well, I've come across a super annoying glitch last night. So, I set up camp to craft some bullets and cook some Big Game Meat. After I was done, I figured I'd set up a tent and sleep since it was raining. Arthur sets his tent up, and I notice in the cutscene my white horse (named Epona, almost maxed out. almost fully bonded) has changed to a Tennessee Walker. I don't think anything of it. Time goes forward, I get out of my tent, and the Tennessee Walker is still there. A Level One Tennessee Walker. So, I ride to the stable in Valentine to see if maybe my Epona was there. Nope. Just the Tennessee Walker I boarded there from the beginning of the game when I first got Epona. So, I searched online. Apparently this is happening to quite a few people. Some have lost their pre-order War Horse, others have lost horses they spent $1000 on. Some people have even had all their money or weapons disappear when this happens. I stopped playing for the night, being aggravated. I'm going to play tonight, but I really hope Rockstar is working on a fix for this. Random_Spock and Smellmet like this. 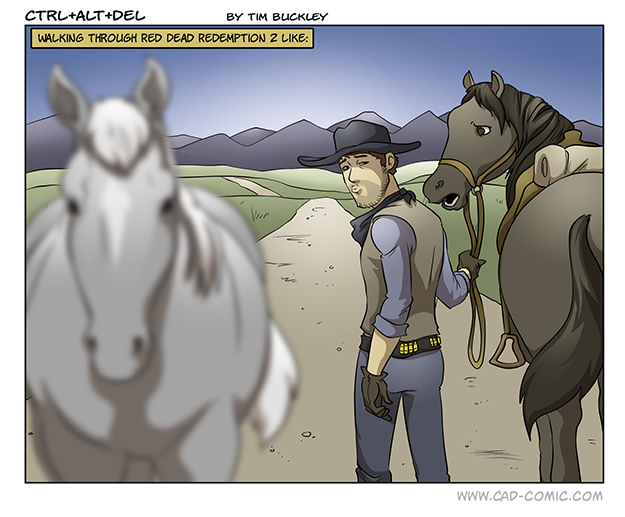 By the time I'm done with The Witcher III, RDR2 should be about twenty bucks! Haggis and tatties and Smellmet like this. ^^You are mad throwing money about like that as if it were grown on tree's, £10 for the complete package is my limit. I had that horse glitch happen as well. I wondered why my horse changed into that. Luckily I only spent $15 on the other horse and I’m usung that money glitch. Same for me. I've been playing for months, and I'm not sure but I think I'm barely half way through. I will admit, it is partly because I've taken a few breaks for weeks at a time, but it's still a pretty damn long game. Same for me. I've been playing for months, and I'm not sure but I think I'm barely half way through. The game only came out three weeks ago. It only feels like you've been playing it for months. Finished the main story about a week ago and now I’m playing the first one, which bizarrely, is a sequel. I never actually completed that one first time round (although I know what eventually happens) so it’ll be interesting to do that for the first time with RDR2 knowledge. I was talking about The Witcher III, not RDR2. In my defense, I'm a blind idiot. BillJ and Turd Ferguson like this. TribbleFeeder and Smellmet like this. Loving the game. There is so much detail. While I'm still very early in the game, the gameworld feels really large and alive, perhaps even moreso than Witcher 3. I'm not even having any issues with the controls. Loving all the little touches and dynamic events. Was riding to a quest marker when I came across a bandit with someone they hogtied. Shot the bandit, and untied the person who then clambered onto the bandit's horse and rode off after thanking me. Another time, came across a woman who had her horse fall on top of her and needed help extricating her legs from underneath it, who then wanted me to bring her to Valentine. I've seen references to stuff like that in some of the reviews I've read, and I wasn't very clear on something. Are those all prescripted, or randomly generated? Randomly generated. I have encountered the same scenario a few times now, but in different areas. Yeah, I imagine they're the equivalent of the random trailside scenarios one encounters in the original, ie the damsel in distress, the ambushes, the people needing a ride back to town, etc. After awhile in the original, since they didn't have all that many of them, they became repetitive, so it makes me wonder how many of these there are now. This game really is quite spectacular. If someone is a wilderness nut, they'll fall in love with the scenery that the game has to offer. I booted up the game today to find Arthur leaned up against a tree at the edge of the Dakota river. It was very serene. And this game has some of the best looking water. It even has currents like one would expect. If you're not careful, you can actually be swept away by strong currents when trying to cross with your horse. You have to choose carefully where you want to cross. It is an incredibly beautiful game. Played about five hours so far, and I'm having a tough time getting engaged in it.